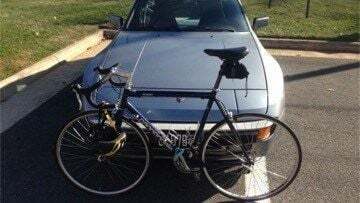 LOUISVILLE, Ky. (WDRB) -- Scott McLallen's bike was stolen after the Ironman triathlon over the weekend in Louisville, and the Washington D.C. native is desperate to get it back because of its sentimental value. After the race was over, McLallen’s bike was leaning up against the Team Z trailer. The team based out of D.C. is a group of athletes that offers training to men and women of all abilities. Around 2 a.m. after the race, Team Z was packing up its trailer and giving away food to some people down on their luck. “Somebody came around back of the trailer where we were working, and he was talking to us and telling us his story," McLallen said. "And the head coach gave him some money, and then he went on his way." Shortly after, it was realized McLallen's bike was stolen. It's a navy blue Cannondale bike with powder blue pedals. “It's a unique racing bike, and it's 18 years old," said Luanne Maguire who’s helping locate the bike. "And it can't be replaced. It's priceless." For McLallen, the bike has sentimental value. Since McLallen is from out of state, Maguire is doing what she can to help find the bike. She's paying it forward after what Team Z did for her son after being injured in Afghanistan. “They helped my son run and train, and he's a medically retired military, and he's an amputee,” she said. So with just as much dedication as Ironman athletes, she's determined to find the bike. “Just please, if you see this bike, please, please let’s get it back to Scott,” Maguire said. Because after all, no amount of money can replace the bike for its sentimental worth. “I thought maybe one day my son or daughter would ride it around town or to get to school or in a race … and that is not going to happen,” McLallen said. If you have seen this bike or have any information, you’re asked to call LMPD.